It’s a good week for Harry Potter fans. Just yesterday, on the 15th anniversary of The Chamber of Secrets, we got a major tease for the sequel to Fantastic Beasts and Where to Find Them that hinted at a upcoming epic duel. But today, marking one year until the second Potter spinoff hits theaters, Warner Bros. announced the official title of the second Newt Scamander adventure, along with a new cast photo and new character details. We knew Fantastic Beasts 2 was going to be all about Grindelwald after Johnny Depp’s Dark wizard escaped at the end of last year’s film, so the sequel title matches up: Fantastic Beasts: The Crimes of Grindelwald. The new movie, directed by David Yates and written by J.K. Rowling, will follow Eddie Redmayne’s Newt on a hunt to capture Grindelwald upon Dumbledore’s request. 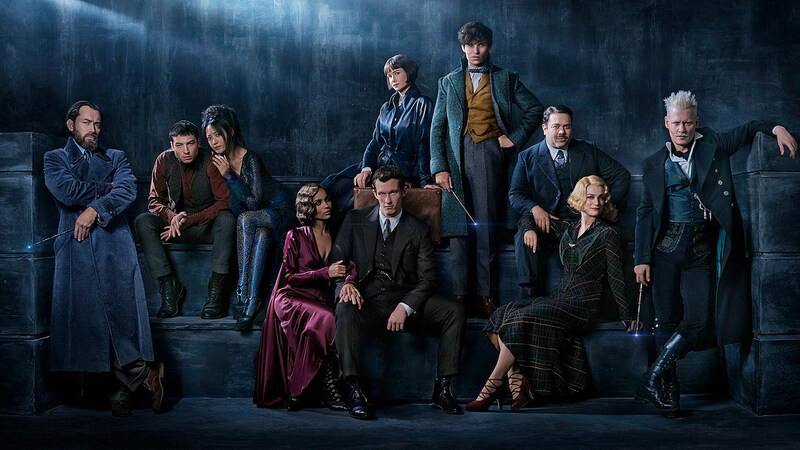 But before we get into any plot details or theories, let’s take a look at this new cast photo, which, yes, includes the very first look at Jude Law’s beloved wizard pre-grey beard. Look at young Albus! All smug and handsome with his dapper blue – is that velvet?! – coat. Of course there’s also Redmayne’s Newt and Katherine Waterston’s Tina Goldstein, who has now been reinstated as an Auror at MACUSA (America’s Ministry of Magic). Dan Fogler is back as fan favorite Jacob the No-Maj, assuring anyone concerned his memory wipe would wipe him from the sequel as well, alongside Alison Sudol’s Queenie. Ezra Miller’s Credence is also back and clearly didn’t die at the end of the first movie, and yes, there’s Johnny Depp. As the title reveals, the sequel will be all about Grindelwald, and we know there’s plenty of good storytelling to mine there. First off, we may actually get to see Grindelwald hunt for the Deathly Hallows and steal the Elder Wand from its maker, Gregorovich, as described in the books. If you take a closer look at the above photo, you’ll notice Depp is indeed holding the Elder Wand while Law is holding one that looks like the second wand teased in yesterday’s photo, a black wand with a brownish head and gold trim. We know Dumbledore will defeat Grindelwald and win ownership of the Elder Wand eventually, but based on the timeline – this movie opens in 1927 and that historic duel took place in 1945 – it’s hard to know if that will happen in the sequel or be saved for the third or fourth movie. Either way, if we do flash back to see the wizards even younger, fingers crossed the movie brings back Jamie Campbell Bower’s Grindelwald.